The defendants regularly sold supplies to the DOD, the Department of the Navy, the General Services Administration and other federal departments and agencies, prosecutors said. Each company had multiple contracts with DOD’s Defense Logistics Agency to sell products to the federal government through EMALL, currently known as FedMall, a web-based electronic commerce site that allows authorized users to search, compare and buy commonly used products. Each contract allowed the company to sell pre-approved goods at set maximum prices. As detailed in court filings, the defendants fraudulently manipulated the EMALL system to substitute unapproved items for the goods purportedly sold to the government. As one example, the defendants agreed on EMALL to supply Maritime Expeditionary Security Group Two at Norfolk Naval Shipyard with more than 10,000 Post-It notepads. After colluding with Navy personnel, the defendants replaced the approved items with 50 electronic transceivers they weren’t authorized to sell. By doing so, they were able to circumvent procurement controls and charge the military a 134 percent markup on the transceivers, according to prosecutors. The defendants employed the fraudulent technique dozens of times on a host of products and across a wide array of components in the military, court documents show. The scheme also allowed the defendants to conceal the sale of consumer electronics and other items that could be readily misused by corrupt military officials, prosecutors said. 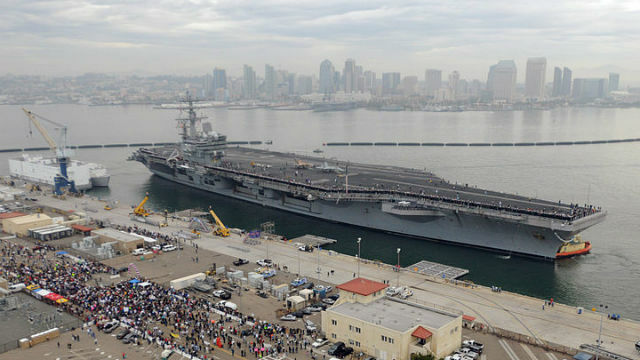 In one contract, VLI agreed to supply the USS Ronald Reagan aircraft carrier with industrial motorized plumber snakes. VLI then fraudulently substituted that order with 100 29-inch Toshiba TVs, 60 32-inch Toshiba TVs and 160 TV tilt mounts, according to the U.S. Attorney’s Office. VLI purchased the items for $39,558, then turned around and billed the government $66,807, court documents show. The plea agreements also detailed a series of transactions between October 2013 and April 2014, in which IXI and another VLI-affiliated company, At Your Command, created about 20 EMALL carts for Navy Explosive Ordnance Disposal Group No. 2 in Norfolk, Virginia, containing various items, including canvas organizer bags and pouches, for which the defendants billed DLA and received $1,303,024. In reality, the defendants actually provided EODG-2 group with parachutes, altimeters and other skydiving gear bought for about $924,252, realizing a profit of $378,772 by substituting improperly procured parachuting equipment, prosecutors said. The defendants were highly successful in their fraud, receiving about $45 million for EMALL sales related to more than 12,000 transactions between about March 1, 2008, and Jan. 31, 2015, according to prosecutors. On a small sample of 60 of those transactions between August 2009 and October 2013, totaling about $2,868,590 in sales, the loss to the Navy was roughly $1.4 million, indicating a fraud loss of about 50 percent, according to the U.S. Attorney’s Office. Harrington and Mayer also admitted making false statements on their tax returns for the tax years 2010 and 2014. The defendants both used VLI to pay personal expenses in excess of $200,000 and $100,000, respectively, thereby underreporting their 2010 income on their personal tax returns, prosecutors said. Both of them continued using VLI to pay for personal expenses and not declaring the benefits as income, causing their 2014 income tax returns to under-report their income by roughly $436,000 and $674,700, respectively. For the years 2010 and 2014, Harrington underpaid taxes by $141,113 and Mayer by $299,511, court documents state. In addition to serving his custody term, Harrington was ordered to pay a $10,000 fine and $141,113 in restitution to the Internal Revenue Service, and to forfeit $708,679 in ill-gotten gains. Likewise, Mayer was ordered to pay a $10,000 fine, plus $299,511 in restitution to the IRS and a forfeiture of $708,678. All defendants in the case will be suspended from government contracting, according to prosecutors.